The 2019 Match Officials Elite Camp was recently hosted in London, Ontario at the BMO Centre as preparation for the 2019 outdoor season. Match Officials traveled from Ottawa, Windsor, the Greater Toronto area and Southwestern Ontario for the 5th Annual Camp. 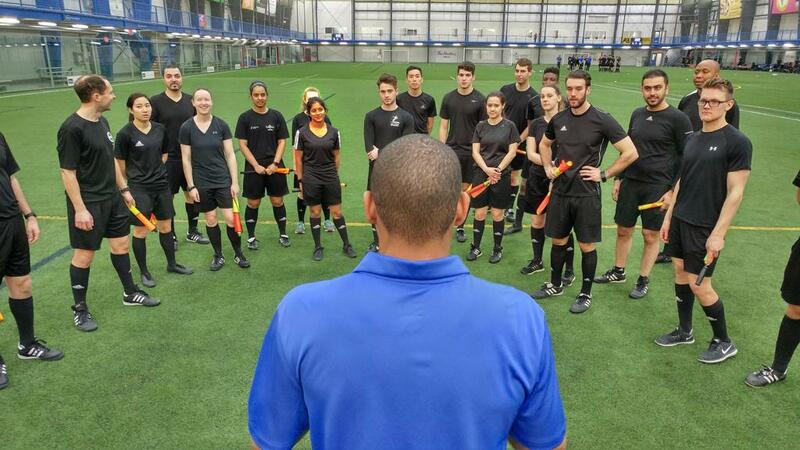 The Elite Camp is a partnership between Ontario Soccer, OCAA, OUA and League1 Ontario and is open to selected Match Officials that have met the requirements for officiating in these leagues. Guest Instructors included National Instructors Bob Sawtell from BC, Joe Audi from Ottawa, Joe Fletcher from St. Catharines and Tony Camacho, Cambridge. Opening presenter Nancy Spotton, CEO and Co-founder of MPWR, engaged the room with activities around communication, connectivity and awareness and was a huge hit with the 76 officials in the room. “This camp is now in it’s 5th year, and attendees comments that this was the best one yet. The presenters were outstanding, the facility was fantastic and the learning opportunities were endless. We have already booked the same facility for 2020," said Nicky Pearson, Ontario Soccer Manager of Match Official Development. "We could not do this without the support of OUA, OCAA, League1 Ontario and Ontario Soccer, and having them all assist with the development of Match Officials in Ontario."